The tattoo does bring changesâ€”not the kind Leslie has dreamed of, but sinister, compelling changes that are more than symbolic. Those changes will bind Leslie and Irial together, drawing Leslie deeper and deeper into the faery world, unable to resist its allures, and helpless to withstand its perils. . . . I loved Wicked Lovely so I expected to love this book just as much. Sadly, I didn't but I didn't hate it either. I did, however, love the characters. I especially liked Leslie. She was in a tough situation and instead of hating everyone and everything she survived it and moved on. I felt so bad for Leslie and her home life. It was sad that she was scared to go home. I loved that her idea of getting a tattoo was to regain her own body again. It was a really cool way to look at letting someone stab you repeatedly with a needle. 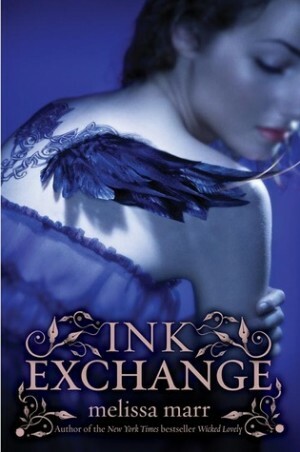 I liked the tattoo aspect of this book, maybe it's because I also have a tattoo. I just like looking at tattoos in general so it was so interesting to read all about Leslie and her tattoo situation. Though, I probably wouldn't like a tat as much if it connected me to a Dark king that used me in more ways than one. That being said I actually liked Irial. Even though he was supposed to be the bad guy, I don't care I like him. Leslie changed him and I thought that was really sweet. I guess I'm just a hopeless romantic in that way. I can't wait to see what book 3 holds in its pages.